For people living on fixed or very low incomes who use human services in downtown Seattle, getting around town in our notoriously hilly city can be a challenge. For many, walking isn’t an option – and for others, bus fare is nonexistent. 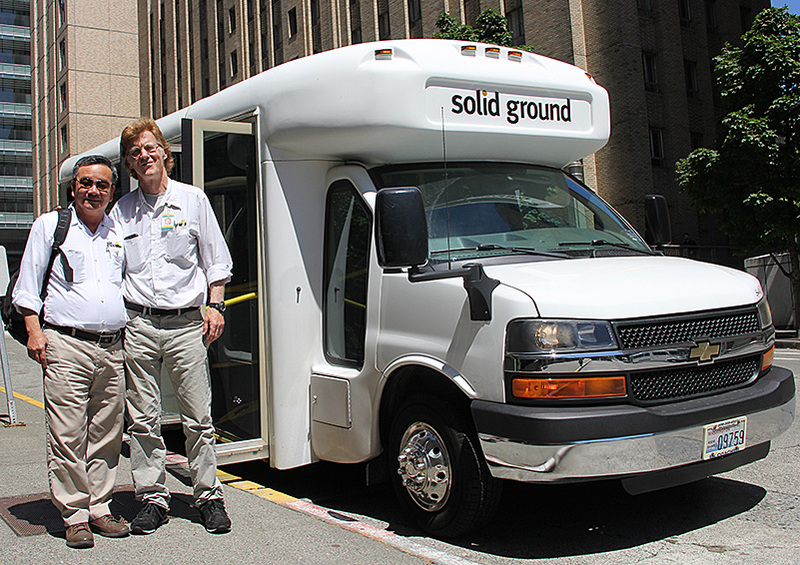 So to help residents access essential services critical to their health and well-being, Solid Ground’s Seattle Downtown Circulator Bus provides free weekday rides along a fixed-route, seven-stop circuit. Over nearly six years of operation and 225,000+ miles driven, SGT Director Kari Ware says, “We’ve had ZERO preventable accidents” despite the challenges of increasing traffic, construction and frequent special events in the Seattle’s downtown area. This speaks volumes to the safety standards and training all SGT Drivers receive – and to the skill and care of the drivers. Longtime Seattleites may remember the days of Metro Transit’s Ride Free Area (RFA), which ran along the downtown corridor for nearly 40 years. In 2012, budget cuts made the service unsustainable. And while Seattle shoppers lamented its demise, the impact was much more than an inconvenience for people experiencing homelessness and/or living with health conditions and mobility challenges – people who need to access essential downtown services. To help mitigate the loss of the RFA, the City partnered with Metro to launch the Circulator, with Solid Ground as sole contractor. 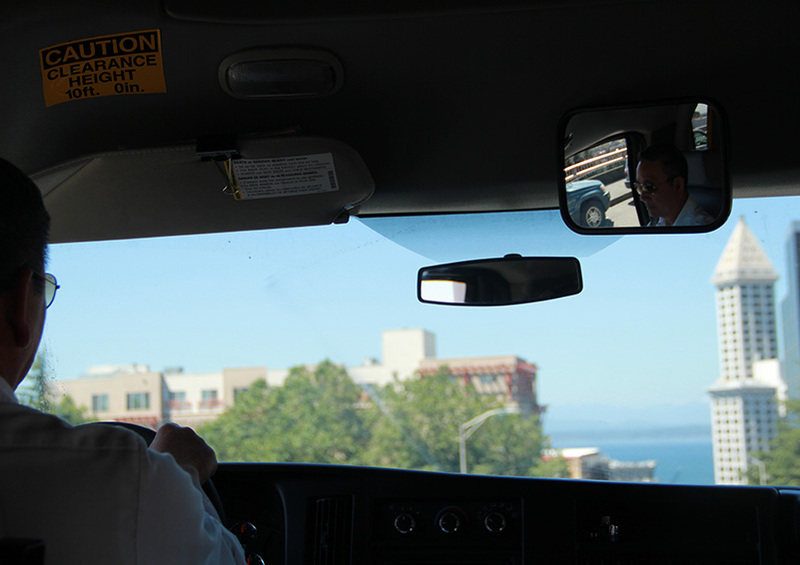 As we ride along with Joe’s colleague Phuong Nguyen, Joe points out the many essential services near or along the route: DESC (Downtown Emergency Service Center), King County Courthouse, Lazarus Day Center, Chief Seattle Club, Pike Place Market Senior Center & Food Bank and more. At the Millionair Club, Joe explains, patrons can get breakfast, lunch and day work – such as handyman and stadium jobs – with free lunch. At the Urban Rest Stop (URS), you can get your laundry done and take a shower. FareStart offers restaurant training, and at the Recovery Café, people in addictions recovery can attend AA meetings and get a solid meal. Circulator Driver Joe McCrea takes the wheel (photo by Lara Breitkreutz). Driver Joe McCrea rides the Circulator (photo by Lara Breitkreutz). Downtown Circulator Bus Driver Joe McCrea (right) takes over the Circulator to give his fellow Driver Phuong Nguyen (left) a lunch break (photo by Lara Breitkreutz). For more information about the Circulator or Solid Ground Transportation (SGT), please contact SGT Director Kari Ware at kariw@solid-ground.org. This is the lead article from Solid Ground’s August 2018 print newsletter. To sign up for email updates, Groundviews Blog email notifications, or to receive the print newsletter by snail mail, visit our Get News & Updates page. Celebrating Solid Ground’s bus drivers!